Today I received an email from a friend in PA with the news that another of our SLO friends has gone on to Heaven. Abigail was sixteen years old. We had met her and her family a couple of times while we lived in PA. When Emma received the SLO diagnosis it was Abigail's mom and my other friend, Brenda, who walked me through those first difficult years. They knew the ropes of finding the right doctors, getting the best treatment, and just survivng. Finding out that Abigail is gone has hit me hard. As I think of what is ahead for her family, I am feeling all of those feelings over again. I remember so well the emptiness and sadness. Life as we knew it stopped. I know people don't mean to but I think they minimize the death of a special needs child because they see it as a blessing. They see the end of a hardship and assume the parents must feel relieved. I don't want to hurt anyone's feelings but I know it is true. I could see it in some people's eyes, hear it in their voices. If I am being totally honest I will admit that there were times in Emma's life when I thought that I might feel a little relieved. When it happened, though, there was no relief. Only loss. Sure, I felt relief for her. For myself, though, I only felt empty. All that I knew was gone. I had been a part of this "club" of special needs moms and I knew how to do that but then I was out of the club and trying to find where I belong. I'm still searching. Even in their death, our children keep on giving to us. One of Emma's special gifts to me when she was here was the gift of perspective. I could be having a rough day and Emma would come home from school and I would take off all of her braces and just hold her and she would be so happy and grateful and I knew that no accomplishment in this world could compare to that smile she gave me. Nothing else mattered. No one could take that away from me. I miss that so much. But, today. 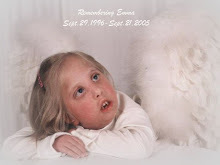 when I read about Abigail and I relived my loss of Emma, for just a little while I got to experience that perspective again. The decisions I am facing, the responsibilities I am overwhelmed with, the people who annoy me... for just a while they disappeared as I looked at them with that eternal perspective. Knowing that the best is yet to come made me smile. Thank you, Emma and Hailey, and now, Abigail. You gave us so many gifts. You are forever missed and never forgotten.